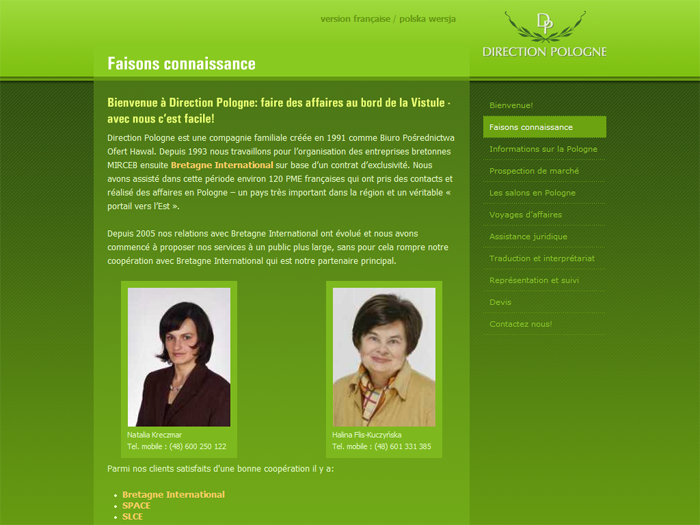 It is a greenish, nice website for French - Polish business company that is working on injecting french companies to Polish market and publishing multilingual books (english/french/polish) for kids. I have designed the graphics, XHTML/CSS code and logotype for this site, it also uses nice SIFR technique for custom fonts dynamic FLASH headers, which looks just great. Go on, take a look: French DirectionPologne.com or Polish DirectionPologne.pl, they are not the same! This website has been arwarded and noticed by dozen of CSS galeries, such as CssMania, CssHeaven, CssGallery, LightOnDark and few more.